York is a town in York County, Maine, United States, near the southern tip of the state. On the 5th (Mon), take in the dramatic natural features at Perkins Cove, appreciate the extensive heritage of Marginal Way Walkway, and then visit a coastal fixture at Cape Neddick Nubble Lighthouse. 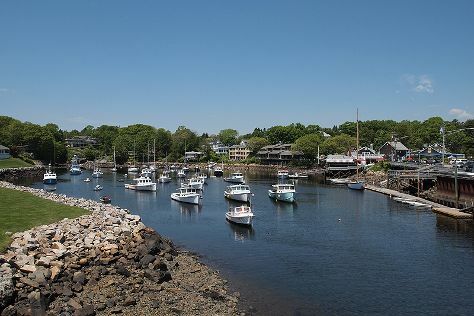 On your second day here, stop by Kittery Trading Post, enjoy the sand and surf at Wells Beach, and then kick back and relax at Ogunquit Beach. For photos, more things to do, traveler tips, and more tourist information, go to the York tour planner . Salt Lake City to York is an approximately 9-hour combination of flight and car. You can also fly; or drive. Traveling from Salt Lake City to York, you'll lose 2 hours due to the time zone difference. Prepare for little chillier weather when traveling from Salt Lake City in August: high temperatures in York hover around 80°F and lows are around 60°F. Finish up your sightseeing early on the 6th (Tue) so you can go by car to Freeport. Freeport is a town in Cumberland County, Maine, United States. Kick off your visit on the 7th (Wed): identify plant and animal life at Maine Wildlife Park, then get some fabulous bargains at L.L. Bean Factory Store, then get a taste of the local shopping with Georgetown Pottery, and finally grab your bike and head to Beth Condon Pathway. For more things to do, other places to visit, reviews, and tourist information, go to the Freeport day trip planning app . Drive from York to Freeport in 1.5 hours. Alternatively, you can take a train; or take a bus. Traveling from York in August, Freeport is little chillier at night with lows of 55°F. Finish your sightseeing early on the 7th (Wed) so you can drive to Bar Harbor. Bar Harbor is a town on Mount Desert Island in Hancock County, Maine, United States. On the 8th (Thu), take a memorable drive along Park Loop Road and then take in the awesome beauty at Cadillac Mountain. Here are some ideas for day two: look for all kinds of wild species at Shore Path and then head off the coast to Mount Desert Island. To see maps, traveler tips, photos, and tourist information, use the Bar Harbor trip itinerary planner . Getting from Freeport to Bar Harbor by car takes about 3 hours. Other options: do a combination of bus and car; or take a bus. August in Bar Harbor sees daily highs of 75°F and lows of 57°F at night. Finish up your sightseeing early on the 9th (Fri) so you can go by car to Camden. Camden is a town in Knox County, Maine, United States. Kick off your visit on the 10th (Sat): look for gifts at Maine State Prison Store and then take in the awesome beauty at Mount Battie. Inspirock's itinerary builder makes planning a Camden trip simple and quick. Traveling by car from Bar Harbor to Camden takes 2 hours. Alternatively, you can take a bus. In August, daily temperatures in Camden can reach 74°F, while at night they dip to 56°F. Wrap up your sightseeing on the 10th (Sat) early enough to travel back home.